The production of horse-drawn carriages has seen a revival in Russia over the last ten years. However, since old traditions seem to have been lost, enthusiasts are starting from scratch, taking inspiration from pictures and old carriages that have survived in museums. The oldest Russian version of a wheeled horse-drawn carriage existed at least a thousand years ago. Referred to as a kolymaga, it was derived from carts used by nomadic tribes from the south Russia. In the early 17th century, the first proper carriages began to be imported into Russia from Western Europe. By the mid-17th century, the number of carriages had increased so drastically that Tsar Fyodor III introduced restrictions on the vehicles, allowing only members of the Boyar Duma (a council for Russian rulers) to use carriages on the streets of Moscow in a bid to avoid traffic jams. While imported carriages dominated, local production of similar vehicles began to grow. According to Mikhail Kazyonkin, a carriage enthusiast and manufacturer, Russian carriages were not very different from those made in Europe, as all the original technology and craftsmen came from there. Later, several schools were opened across Russia to train talented boys to become carriage craftsmen. One of the schools was located in the village of Pakhrino, south of Moscow. 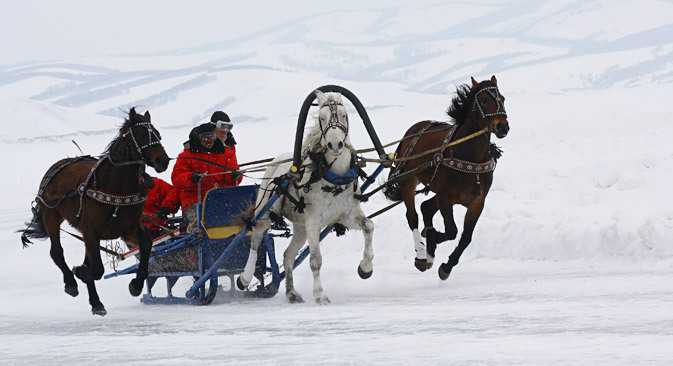 The troika, a harness-driving combination that used three horses abreast, pulling a sleigh or a carriage, was invented in the early 19th century in a bid to speed up horse-drawn traffic. It became a Russian cultural icon almost as resonant as the balalaika or vodka and was immortalized in Nikolai Gogol's "Dead Souls" as a symbol of fast riding – and of Russia itself. Troikas traveled back and forth on the dirt road connecting Moscow and St Petersburg, covering the distance of roughly 750 kilometers in about a week. With the introduction of stagecoaches in the 1820s, the travel time was reduced to between four and five days. Students spent 12 years in the school learning the craft, which only gave them the status of apprentice, and only the most talented and hard-working were able to become full-fledged craftsmen. Much like cars these days, carriages were supposed to reflect the owner's social status. The richest and most lavish carriages were owned by the emperors. Those who have visited the Hermitage museum in St Petersburg will have seen the gilded Coronation Coach that was used for the coronation ceremonies of Empresses Catherine I and Catherine II (the Great), made to special order by French manufacturers. For most of the 19th century, luxurious carriages were imported from France, but "economy class" horse-drawn vehicles were actively manufactured within Russia, both by individual craftsmen and small factories. The most popular locally-produced type of carriages was based on French phaetons – lighter vehicles with folding roofs. Normally, three separate factories were involved, specializing in the manufacture of the chassis, the body and roof and the seats, respectively. At the beginning of the 20th century, motor vehicles began to replace horse-drawn carriages, and the craft of carriage making gradually became obsolete. The first motor vehicles still used many elements of carriages, but as automobile design evolved, it moved further away from its predecessor. However, several decades later, when horse-drawn carriages became a thing from a faraway past to be seen only in museums and period movies, interest in the obsolete transportation form began to revive. Carriage rides have now become a popular tourist attraction in several cities, while some horse owners have shown interest in owning a carriage as well. Kazyonkin has been involved in carriage manufacturing since he built his first horse-drawn cart in the late 1980s. "I wanted to make a living doing that," he said. "Previously, I was involved in the horse-riding business, and it was a natural step from offering a horseback ride to a carriage ride. So I made a cart, then another one, and so it all began." Kazonkin currently runs a shop that manufactures carts, carriages and sleds of various kinds. But reviving the old tradition turned out to be a very hard task. "It's impossible to restore the traditions of the craft," said Kazyonkin, adding that he designs his carriages by himself as opposed to using old drafts, but derives inspiration from items that have survived in various museums. "I have found some in the Hermitage; the [film studio] Mosfilm also has some in its collection," he said. According to Kazyonkin, the people who buy his carriages are mostly entrepreneurs who offer carriage rides as a tourist attraction and private individuals interested in horses. "Someone, for instance, could make himself a birthday present like that," he said.